PolyPatch was used to prepare concrete pavement for a New York City Department of Transportation ultra thin overlay project. The New York City Department of Transportation (NYCDOT) was considering reconstruction options for 1st Avenue, which had been reconstructed in 1983 using Portland cement concrete. Scott Roveto, Director of Technical Services from the NYCDOT had concerns about causing damage to old steam pipes, sewage pipes and electrical systems located below the roadway, if full depth reconstruction was done. It was therefore decided to do a thin lift asphalt overlay using a highly modified asphalt (HiMA) mix. Further, the NYCDOT also wanted a product applied prior to the overlay that would reduce reflective cracking. 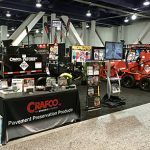 Because of this, they initially considered Crafco Paveprep. 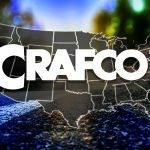 When DOT officials met with Crafco personnel and the HiMA manufacturer, it was agreed that the mix would be adjusted to reduce reflective cracking, but the cracks, voids, and potholes still needed to be treated to eliminate areas of low compaction when rolling the thin lift overlay. 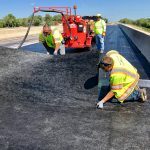 Crafco PolyPatch was chosen because of its ability to successfully seal the cracks and voids while providing a stress absorbing interlayer directly over the distresses in the existing pavement. The quick and simple application, and the ability of PolyPatch to hold up to the location’s high traffic prior to the overlay was also considered in making this choice.